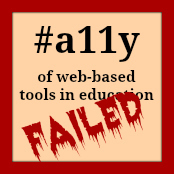 In my previous post, Mea Culpa – Accessibility Concerns of Using External Tools in the LMS, I mentioned the accessibility concerns that come from using many of the popular external tools (Web 2.0 tools, if you will) inside the LMS. One tool that I frequently have recommended over the years is Slideshare. Here’s a video that I put together back in 2007 about using SlideShare inside the LMS (D2L). That was then, this is now. For a long time there were inherent problems with using PowerPoint slide decks on the web. Sure there were various ways to do it, but none of them were great. That’s not quite true, because there were some great tools, but they weren’t free; which was another aspect of the tools that I shared in my presentations. They needed to be free, and easy to use. Web accessibility was not one of my criteria, but it is now. You can view the Slideshare transcript (opens in new window) at their site, but these slides were not constructed to be accessible. Thus, the transcript is not very useful to the unsighted user. There is a great deal of information in the slides that they would not have access to. The easy to find, easy to use embed code was one of the reasons why I liked Slideshare. Webbifying the otherwise bulky, clumsy PPT slides was so much better than trying to get native slides to play nicely in the browser. But what about accessibility (a11y), you ask? You can make PPT slides that conform to most of the a11y standards (or good practices, if you prefer). Wouldn’t it be great if your accessible PPT slides could be uploaded into Slideshare and still be accessible? Sure, that would be great. Sadly, that’s not how it works. At least, it won’t work that way without you planning ahead to make it so and then jumping through a couple of extra hoops. PPT slides are converted into images. There is no way to attach alt text to the slide images in Slideshare. Therefore, you must include all pertinent information in text format for each slide (methods described below). Although a transcript is created by Slideshare, the transcript is not ported over with an embed of the slides in another site, such as in the Content section of the LMS. Students would need to navigate to the original page at the Slideshare site in order to access the transcript, and then they have a lot of other stuff to navigate through before reaching the transcript (thinking from the perspective of a student using a screen reader such as JAWS). The transcript only includes those things that are in text format in the original PPT slides. In other words, if you use images in your PPT slides, there is no information at all about those images in the transcript in Slideshare, unless you describe them in your text. You can embed a YouTube video (should it be captioned? Yes, but many are not) into a Slideshare presentation, however, I cannot see how a student using a screen reader would be able to operate the video controls which are now inside the Slideshare frame. For a few years, Slideshare had an option to add an audio track to narrate your slides. Although I never checked it for a11y, it potentially could have been a boon to students who could listen to the narration. However, Slideshare removed this “Slidecast” feature during early 2014. I’m cognizant of the move in recent years to more of a “Zen” approach to PPT slides – with heavy emphasis on images and minimal text. This approach is great for live presentations, but not so great if the slides are going to be shared for asynchronous viewing. Zen-type slides will only cause greater issues for sight-impaired students due to the lack of explanatory text. For my work-around examples, I’ll go with heavy imagery in the sample slides. So, if you’re going to use Slideshare for delivering course content to your online students, how can you do so with an eye on accessibility? Here are a couple of work-arounds. All important information about each slide needs to be made available to students in text form, probably in the Slideshare transcript. Method one is to hide the text behind the images on the slide, with the resulting text appearing in the Slideshare transcript. Method two is to use the Notes field in the PPT program to put all the info needed for full learning. Then convert the PPT into a PDF, with the Notes Pages selected as the saved format. This then puts the Notes into the Slideshare transcript. For illustrative purposes, I’ve made a simple four-slide presentation using PowerPoint. I have then uploaded two versions of those slides to Slideshare, with the embeds shown below. Method One. The Slide Title holder is placed on top of the image and formatted for readability for sighted students. The explanatory text is hidden behind the image which will then populate the Slideshare transcript. After embedding the slides into the LMS, I would also copy and paste the transcript from Slideshare into the LMS content page. Also, Slideshare seems to be putting the title text AFTER the slide text, which seems weird. I edited the transcript to put the title text in the appropriate spot in the pasted transcript. Method Two. The descriptive text is placed into the Notes field in PPT. The Notes View is then saved as a PDF and the PDF is uploaded to Slideshare. Sighted students now have the advantage of seeing the explanatory text, and the transcript provides the same information for sight-impaired students who are using a screen reader program, but keep in mind that unsighted students using a screen reader will not hear any information from the slides & notes in the Slideshare embed. As in method one, the transcript is copied from Slideshare and pasted into the LMS content page so that students don’t have to navigate out of the LMS to the bottom of the Slideshare page. Overall, this is a lot of work to make these slides accessible when using Slideshare. Although I have been a long-time fan of Slideshare, I’d be inclined to dump it altogether for a more accessible presentation program. Sadly, as we’ll see in future posts, there aren’t many choices for that. NOTE: for this particular tool, I only looked at the perspective of a faculty member using it to provide slide content to a class of students, not looking at the issues with students using the tool themselves for uploading slide shows, which creates different concerns. Barry Dahl is solely responsible for the views and opinions contained in this post. No other association with any legal entity is implied or real.